This is a really great looking bag tag. Great for the guys too. Earth tones colors. The front can be personalized with the name of your choice. The back can be the same as the front or have your contact information printed. 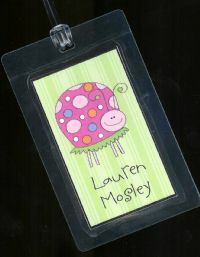 Perfect bag tag for backpacks, dance bags, sports bags or luggage! Front will have the name of your choice printed. The back can be the same as the front or have contact information such as telephone number, address, etc.. listed. Really cute! I promise this little ladybug will make you smile! Personalize this bag tag any way you wish. The front can have the name of your choice. The back can be the same as the front or have contact information printed. 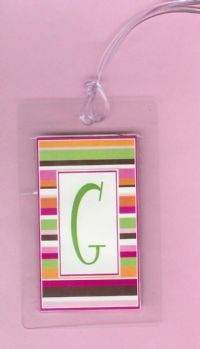 This cocoa stripe bag tag features the initial of your choice on the front. The back is printed with contact information (telephone number, address, email address, etc..) OR whatever you like! Please enter information for bag tag here! My personal design from my own luggage! I set out to design myself a new bag tag to go on my own luggage and carry-on bag and this is the end product. The front has the initial of your choice and the back is printed with contact information. Please enter all info for your bag tag here. Really adorable bag tag! The front is personalized with the name of your choice. The back..has contact information printed or you can get the front design duplicated on the back! Please enter all information for bag tag here! Something for the boys! This bag tag features a camo border with "safety" orange lettering. 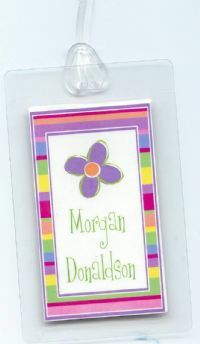 The back can be personalized just like the front or contact information (phone #, address,etc..) can be printed. Please enter all the information you would like printed on your bag tag here! Cute little bag tag full of polka dots! 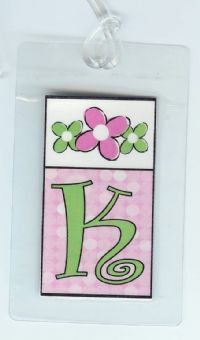 Initials or your name can go on the front. The back can be the same as the front or you can add contact info (name, address, phone, etc..) on the back. Your choice! Please enter information for the front and back of your tag here. The most adorable little pink giraffe on a vertical bag tag! So Cute! Matching Note Cards and stickers are also available. Contact information can be printed on the back of bag tag.